Editor's note: Our guest blogger is Richard Huré, CIO of digital creative group Fred & Farid Group. See what other organizations that have gone Google have to say. Fred & Farid Group is the first French independent Digital Creative Group based in Paris and Shanghai. Founded in 2006 by Frederic Raillard and Farid Mokart, we create digital integrated ad campaigns for global brands such as Audi, Porsche, Diesel, Société Générale, Garnier, and Mondelez. We’ve grown extremely fast and now have more than 350 employees in our Paris and Shanghai offices and have won 129 digital distinctions since 2011. Though Fred & Farid is known for its tech-savvy campaigns spanning web, mobile, social, video and music, until recently, we used old-school business applications like Lotus Notes and Microsoft Office. When I joined in 2011, I wanted to move our company to the cloud to improve efficiency and increase collaboration between our creative, technology, and business teams in France and China. I chose to roll out Chromebooks because Chrome OS is the perfect operating system for the cloud -- it’s easy to manage and maintain, makes collaboration a snap, and offers integrated security and control. Macs are a popular choice among the creative team. But I soon realized not everyone needs a Mac, especially the 60 percent of our employees who work in office roles like marketing, sales, IT, and administration. We recently rolled out 10 Samsung Chromebooks in a small pilot and plan to have 200 employees on Chromebooks by the end of the year. Our decision to adopt Chromebooks wasn’t based solely on price -- though we expect to save a significant amount compared to deploying Macs -- but also a desire to have faster collaboration. When you have a Chromebook, you think less about downloading stuff to your hard drive and more about sharing information in the cloud. With Google Drive, we're able to store, sync and share all our important files easily, whether it's when we're on our Chromebooks or on our phones and tablets on the go. We use Google Hangouts for all our voice communications -- we don’t even have phone lines in our offices anymore. In the Paris office alone, we conduct more than 50 Hangouts each day. Of course, we also use Drive for document sharing and Calendar for scheduling. From an IT management perspective, Chromebooks are a dream. Using the management console, we can push apps onto employees’ devices, including some in-house collaboration apps we’ve created like the Fred & Farid Bridge, a social network where employees share photos, videos, music, and other creative ideas. In the future, when we have 200 Chromebooks, we’ll explore new ways to use the Management Console, including for security and analytics. Chrome OS is like a blank canvas, and we can’t wait to come up with new ways to use it. 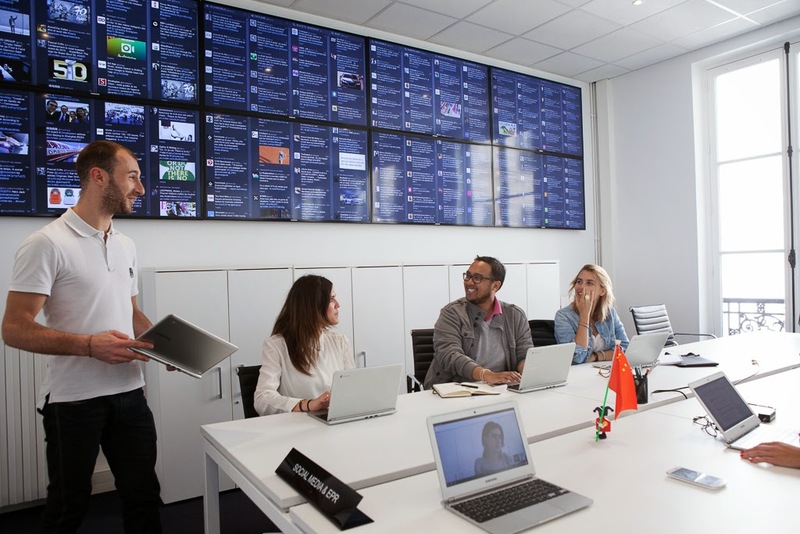 I’m thinking about installing scannable tabs on meeting room doors, and when employees enter they can check in with their smartphones so the rooms show up as ‘booked’ in Google Calendar. Creativity thrives when people can freely communicate, collaborate, and share ideas. Chromebooks will help us unify employees across time zones into one collaborative team -- even as the company grows at an unstoppable pace. Revised Editor's note: Today’s guest blogger is Dale Edman, Vice President of E-Commerce and Online Marketing for The Wasserstrom Company, a supplier and distributor of restaurant and food service supplies based in Columbus, Ohio. Due to a misprint, the Search speed improved for businesses and consumers, with results delivered in 300 milliseconds not .003 seconds. See what other organizations that use Google Search Appliance have to say. When our customers in the restaurant and foodservice industries visit our website, they don’t have time for leisurely browsing – they know what they need and they want to find it fast. The same goes for consumers who don’t want to waste time hunting for that perfect cast-iron skillet or chef’s knife from among our 100,000 products. Search results on our website used to take as long as 10 seconds to show up, which was frustrating for shoppers and would drive them away. We needed to bring speed to our search, as well as more user-friendly ways to promote our products in our search tools without calling in IT help. We knew we had to go Google. It made sense to choose the people who know search the best. One of the things slowing searches down was the way our IBM search product managed our customized catalogues, which is how our business customers shop for their own hand-picked products. Even if a catalogue contained only a couple of hundred products, every search request looked for matches within the entire product database – an unnecessary process that created delays. For both the business and consumer sides of the business, we chose the Google Search Appliance (GSA), an improved search product targeted at online retailers like us. We also used the Searchandiser, a third party tool powered by the GSA, that gave us more control over how we promote products in search pages – for example, we can add synonyms and refinements that help customers search more accurately. Search speed improved for businesses and consumers, with results delivered in 300 milliseconds instead of 10 seconds. The GSA searches only the products within a business customer’s catalogue, which means results turn around faster. In the near future, we’ll use GSA to add even more custom touches to business customers’ catalogues – like detailed descriptions of products, and special search landing pages built around brands or product types. With the GSA, our customers find what they need faster, which means less time spent searching and more time for making their kitchens run smoothly. Editor's note: Today’s guest blogger is Director Chen Shou-Chiang, who leads the Information Management Office of DGH. Read their full story here, learn about the six ways Maps are Going Google and see what other organisations that have gone Google have to say. Taiwan is prone to natural disasters. Earthquakes, typhoons, landslides and heavy rainfall are very common, especially during the monsoon season. As the authority in charge of Taiwan’s land transport infrastructure, the Directorate General of Highways needs to ensure the safety of road users across 7,000km of highways, 4,000 bridges and 200 tunnels. We used to rely on civilian drivers or news media for updates on road conditions. This did not allow us to respond fast enough to emergencies. We want to be able to predict crisis situations so that we can alert motorists and the general public. We also want to know when we need to dispatch rescue teams immediately. We were already using the free version of Google Earth for our existing web-based platform known as thb-GIS (Geographic Information System). The platform consolidated important weather and environment information across 19 government agencies and private companies. The agencies accessed the platform for safety management and disaster prevention. However, these databases could not provide us with intelligence that we could use directly. It took time to join the data before we could use it. We wanted a solution that could overlay images, terrain and vector data over the map of Taiwan to quickly identify areas that are likely to be affected by a weather crisis. We ran comprehensive tests to trial Google Earth Enterprise and were confident that it met our requirement for stability, performance, security and user-friendliness. Google Earth Enterprise allows us to define access rights for different groups of users. This is an important requirement if we want to share the intelligence with other agencies and the public. Our next step was to develop SafeTaiwan, a platform that overlays crucial data used in emergency response to a map of Taiwan. This gives us a rich visual dashboard that immediately provides insights for better decision-making and risk management. With Google Earth Enterprise powering SafeTaiwan, we are now able to monitor real-time conditions on the ground. To further complement available data, we installed 2,800 CCTVs across the country, streaming live images that help us to accurately assess and prioritise our responses during emergencies. The solution improved emergency response time tremendously. Previously, it took us hours to determine the magnitude of any disaster. Today, it only takes us minutes. More importantly, it allows us to analyse historical data to help in predictive disaster management. For example, rainfall readings collected at ten-minute intervals are displayed on Google Earth Enterprise’s dashboard to forecast an approaching typhoon or flash flood. Warning signals are then sent out through SafeTaiwan to alert the public and agencies concerned. The positive feedback we received from our employees and the public has spurred us on to continue developing the platform for greater use. We have a vision to expand the boundaries of SafeTaiwan to share data from around the region. Eventually, we want to promote greater cooperation in disaster preparedness and recovery efforts across borders. We are confident that with Google Earth Enterprise we will be up for this challenge. Editor's note: Today, guest blogger Uzi Bashan, Fire Officer with Israel’s Fire and Rescue Commission, tells us how his organization relies on Google Maps for Business to quickly identify and put out tens of thousands of fires per year. Discover why forward-thinking organizations are investing in tools to help them prepare for situations in advance, including mapping technology. Read more about the six ways Maps are Going Google. Israel’s Fire and Rescue Commission runs the nationwide emergency fire response system, dispatching a team of 1,850 firefighters to blazes large and small within minutes of fires starting. We operate 24 call centers that field 87,000 emergency calls per year, 44,000 of which are fire-related. Responding to fires is a complex process. Call center operators quickly obtain details, alert the closest firefighters and report the incident to the national control center. Then, operators at the control center calculate the fastest route for the firefighting team, often guiding them through dangerous terrain. We used to rely on a GIS application, which was integrated into a larger nationwide network for managing and monitoring all fire incidents.The GIS application was plagued with slow response times, causing delays getting firefighters to fires: firefighters must reach fires within seven minutes, on average, before risks to life and property dramatically increase. Our old system took too long to calculate routes to fires, costing us precious minutes. After the devastating Mt. Carmel fire in December 2010, which killed 44 people, injured dozens, and wiped out nearly 40,000 acres of forest, senior officers at the Fire and Rescue Commission realized we needed a more advanced fire alert system. This prompted our decision to deploy mapping technology from Google. Now, using Google Earth Enterprise as our main GIS mapping platform, each call center operator has two screens - one displaying information from the national system, and the other displaying maps with Google Earth. Google Earth maps, with customized data layers, are automatically updated in real-time to show exactly where fires are and which firefighters are the closest to them. What used to take minutes now takes seconds. Google Maps have a resolution at least four times higher than the old GIS system, so dispatchers can clearly visualize the area around a fire. Using custom information layers developed by the Fire and Rescue Commission’s IT team, dispatchers can get access to deeper information, such as building height and depth and type of terrain, within a few clicks. They can also visually locate the nearest water sources, including hydrants, reservoirs and private pools and ground-level details, helping dispatchers determine if a street is too narrow for a fire truck to pass. The information helps us make split-second decisions around which firefighter teams to send and how to get them there quickly. Call center operators and firefighters alike are simply stunned at how Google mapping technologies have helped them do their jobs. With 99.9% up time, an easy-to-use interface, and automatic, real-time incident updates, Google Earth Enterprise provides the reliable tools we need to respond to fires quickly and safely. Now, our emergency responder can reach fires in seconds instead of minutes. And in a profession where every one of those second matters, gaining that time back helps us save lives and property across Israel. Bring your own device (BYOD) is no longer just a trend — it’s how business gets done. With thousands of mobile applications to choose from and an increasing number of websites optimized for mobile, today’s employees can work whenever and wherever they choose. It also means IT organizations now have the dual challenge of both helping employees be more productive and protecting corporate data. Inactive account wipe: Set policies that will wipe an inactive account from a device if it has not been synced for a predetermined number of days, so a lost device that wasn’t reported or the old device left in a drawer does not cause a security risk. Support for EAP-based WiFi Networks: Configure settings and distribute certificate authority (CA) based certs for EAP networks. Compromised device detection: Set policies that will detect signals for common forms of a compromised device, such as “rooting” or installing a custom "ROM", and block that device. Additional reporting fields: Access new reporting fields via the API and Admin console to better understand the devices that are in use and troubleshoot issues. Additional fields include: Serial number, IMEI, MEID, WiFi MAC address, baseband version, kernel version, build number, mobile operator/carrier, language settings, and account ownership/management. 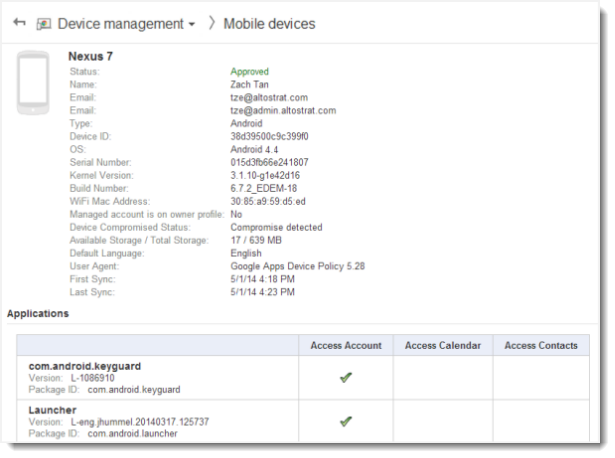 To learn more about these mobile device management features visit our Help Center. You can also visit the Google Admin console at admin.google.com to enable this service to help you rest assured that your corporate data stays safe. Around the world, schools are finding innovative ways to use technology to break down the traditional walls of the classroom, while overcoming the challenges of higher academic standards and tighter budgets. Today, we’re pleased to share the stories from two schools in Wales who’ve gone Google to help them meet the demands of a modern-day education system. Gowerton School in Gowerton Village serves 1,135 students aged 11 to 18. The IT team migrated students and educators from on-premise email to Gmail and Google Apps. Industry experts recognize them as one of the first schools in Britain to embrace cloud technologies. The school’s entire curriculum – from geography to cooking – is taught with Google Apps. Students can access assignments, lesson plans and other learning resources through Google Drive, while teachers can provide immediate feedback through Google Docs. This has brought about significant teaching and learning benefits including greater collaboration and more tailored feedback. Additionally, the move to Google allowed the school to re-invest cost savings from using cloud-based technologies. Gowerton saved £30,000 (US$50,000) in licensing and server maintenance, allowing them to buy numerous Chromebooks. 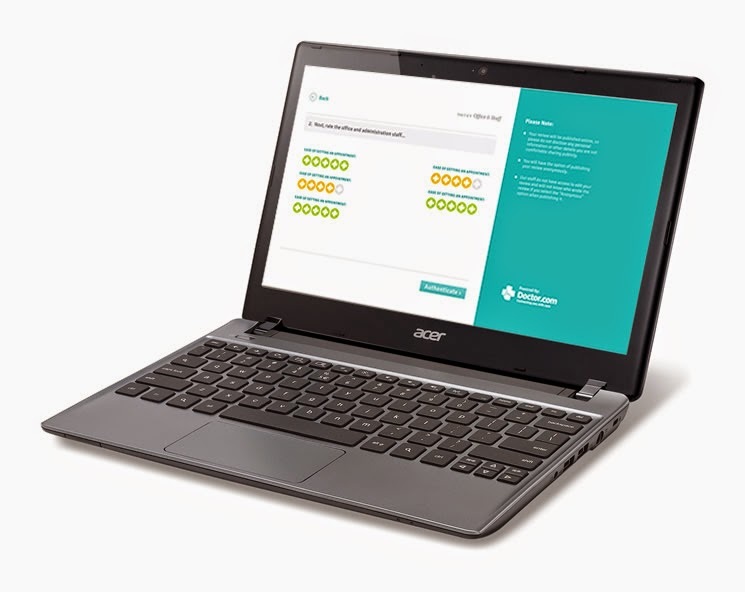 Chromebooks are ideal for Gowerton because they’re easy to maintain and can be used by anyone without much training. Coleg Cambria in North East Wales has also gone Google. Coleg Cambria is one of the largest colleges in the United Kingdom, serving more than 7,000 full-time and 30,000 part-time students. Previously, students used Microsoft Live@edu accounts — but as the college expanded, the IT team struggled to support all the new accounts from a time and cost perspective. The problem was solved when the IT department moved everyone to Google Apps and installed Chromebooks around campus. Thanks to the remote, web-based management console, Coleg Cambria found Chromebooks easy to deploy to a large, growing body of students. Furthermore, the IT team no longer had to spend time going to each computer to install an update, since Google pushes these automatically. You can read more stories of how passionate educators and talented students are using Google for Education in their learning environments. We’re excited to hear such stories of how technology helps prepare today’s youth for a better future. Editor's note: During public emergencies, quick response and recovery is critical. That’s why forward-thinking organizations are investing in tools to help them prepare for situations in advance, including mapping technology. Read more about the six ways Maps are Going Google. Over the thousands of years people have lived in cities, we’ve developed sophisticated infrastructure to keep things humming. Generally, we’ve gotten pretty good at creating safe places where people can work and live. So when it comes to running cities in the year 2014, what could go wrong? Rolling blackouts, spikes in population, and natural disasters drive home one very important point: We can’t control the unexpected. We can, however, plan for it. Take Pedro Junqueira, CEO and Chief Operating Officer of the Center of Operations (COR) in Rio de Janeiro. As Brazil’s second-largest city gets ready to host the 2014 World Cup and 2016 Olympics, Pedro needs to keep this vibrant city safe and running smoothly. He heads a team of 400 people who constantly monitor the city’s activities — while integrating the efforts of nearly 90,000 employees from 30 agencies, including the Mayor’s Office and the Municipal Guard. With all of these different teams working together to minimize public risk, it’s crucial that communication be efficient. To gain a complete real-time picture of what’s happening, Pedro and his team are implementing maps to visualize information from various organizations and present it on a screen in the command center. Spot potential crises, alert citizens to possible danger, and keep emergencies from becoming disasters. Provide the public with up-to-date, critical information, such as evacuation plans, road closures, and shelter locations. Coordinate rescue and relief efforts by seeing up-to-date status of teams, volunteers and citizens. Verify employee whereabouts in affected areas and more efficiently communicate with remote workers. Preparedness starts with having a game plan everyone understands and can implement quickly. Today, corporations, small businesses, and municipal governments have access to practical map solutions that can ease their day-to-day operations and help them run better. We can’t control the weather or prevent every single crisis, but we can take measures to plan for the unexpected. To learn how maps can help your organization prepare, recover and respond, sign up for our exclusive “Maps are going Google” series or read Chapter 2 now. Editor's note: Did you know 60% of young business owners saw an increase in customer engagement after getting a professional email address? Or that 81% of young business owners said that online file sharing is critical to their businesses? That’s just a snapshot of what we learned from the Young Business Success report and infographic we released to kick off National Small Business Week. To recognize and celebrate the young businesses taking the entrepreneurial leap, we’re revisiting a few customers to hear how they got their businesses off the ground and what they’ve learned along the way. Today, we hear from Jeni Britton Bauer, Founder, President and Creative Director or Jeni’s Splendid Ice Creams, who first shared their Gone Google story in 2012. What was the inspiration for starting Jeni’s Splendid Ice Cream? I was 22 when I knew I wanted to make ice cream. I had spent some time blending perfumes with essential oils, and one day, decided to mix some cayenne essential oil with a cup of chocolate ice cream. It was cold. It tasted like chocolate. After a few seconds it burst into flames in the back of my throat. I couldn’t stop thinking about it and knew I’d found my canvas. So I left Ohio State University, started Scream, and sold the delicious dessert concoctions out of the North Market in Columbus, Ohio. Scream lasted two years, and while it failed to become a profitable business, it made the foundation for what became Jeni’s just a few years later. I learned a lot in those two years, especially the importance of having a balance between being new and being consistent — I loved making new, unique flavors like goat cheese with fresh cherries each day, while customers sometimes just wanted their go-to salted caramel day after day. So I created a dipping cabinet for our signature blends, and kept another for the experimental concoctions. It worked. And here we are today, with nearly 400 employees and our ice creams being sold in over 1,200 grocery stores. How has using Google Apps helped you in building and growing your business? Google Apps makes it possible for businesses like ours to exist at all. When I started Jeni’s, I didn’t have to hire an IT guy to tell me how many servers I would need, which meant we could put that money towards our ice cream flavors instead. Equally important is how Google Apps helps our business feel like a family. Yes, being profitable is essential (I learned that with Scream), but it’s the people that make us successful, and Hangouts keep us connected as we grow and hire throughout the country. We hold company all-hands meetings, new flavor brainstorm sessions and weekly status check-ins over Hangouts, so our employees in California feel like they know their colleagues in New York, despite the distance and lack of in-person contact. Also, here’s a fun fact: I wrote two books on Google Docs. We organize recipes and track our changes and tweaks along the way in Docs, so everyone can access a single document and add their updates and comments, and it just made sense for me to do the same for my books. Any advice for other aspiring or budding entrepreneurs? Starting with nothing is a hidden blessing, so don’t let a need for scrappiness get in the way of launching your business. Having your boots on the ground from the get-go means learning about every aspect of the business — not just the fun stuff (the ice cream mixing) but the hands-on stuff (serving the goods) and the stuff you thought you’d never imagined yourself doing (financial statements). You learn the ins and outs and the nitty gritty details of running a company, which is an essential skill for any small business owner. And never distance yourself too much from the customer; they’re the ones your livelihood relies on, so make sure you keep an ear on the ground. Make sure you do something you love. I’ve gone through plenty of tough times, but I didn’t question what I was doing because I knew it was my passion. I took the plunge for something I knew I was meant to do. Millions of businesses trust Google to keep their data safe—a responsibility we take very seriously. We focus on protecting our customers’ data from all unauthorized access, whether from common phishing, sophisticated hacking, or state-sponsored intrusions. That’s why this spring we implemented new, mandatory HTTPS connections to secure user access to Gmail and protect email messages as they move to Gmail servers. Mail routing, delivery controls and SMTP relay service—Control the flow of information to and from your company with policy-based routing to ensure that company messages are filtered, even if they are sent from third-party or other non-Gmail sources. Attachment compliance—Protect your business by blocking or rerouting messages based on what is attached to emails, providing controls over what content is sent and received. TLS Encryption of message content—Prevent eavesdropping and message spoofing through secure encryption and delivery. In addition to these increased security measures, as we recently announced, we’ve now turned off ads in Google Apps services. This means administrators no longer have the option or ability to turn on ads in these services. We’ve also permanently removed all ads scanning in Gmail for Google Apps, which means Google does not collect or use data in Google Apps services for advertising purposes. Customers who have chosen to show AdSense ads on their Google Sites will still be able to display those existing ads on their websites. However, it will no longer be possible to edit or add new AdSense ads to new or existing sites. All this is part of our commitment to providing the best security to ensure your data is protected, while strengthening the features our Google Apps customers care about the most. Editor's note: Did you know 60% of young business owners saw an increase in customer engagement after getting a professional email address? Or that 81% of young business owners said that online file sharing is critical to their businesses? That’s just a snapshot of what we learned from the Young Business Success report and infographic we released to kick off National Small Business Week. To recognize and celebrate the young businesses taking the entrepreneurial leap, we’re revisiting a few customers to hear how they got their businesses off the ground and what they’ve learned along the way. Today, we hear from Adam Wilson, Co-Founder and Chief Software Architect at Orbotix, who first shared their Gone Google story in 2013. What was the inspiration for your business? What made you decide you’d stop what you were doing and pursue it? Our inspiration was simple: change the way people interact with robots. Before we started Orbotix, my co-founder Ian and I shared a frustration with the lack of cost effective computing brainpower in the robotics space, especially with phones. We decided to use smartphones to change the robotics world — with Sphero, a robotic ball that could be controlled with your smartphone. 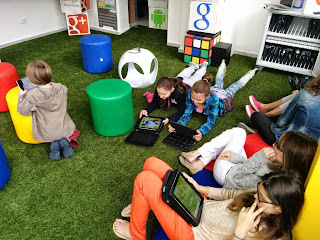 Our idea has broadened to the “connected play” space, but we still aim to change the interaction of the physical with the digital. Our decision to go full forward happened quickly. 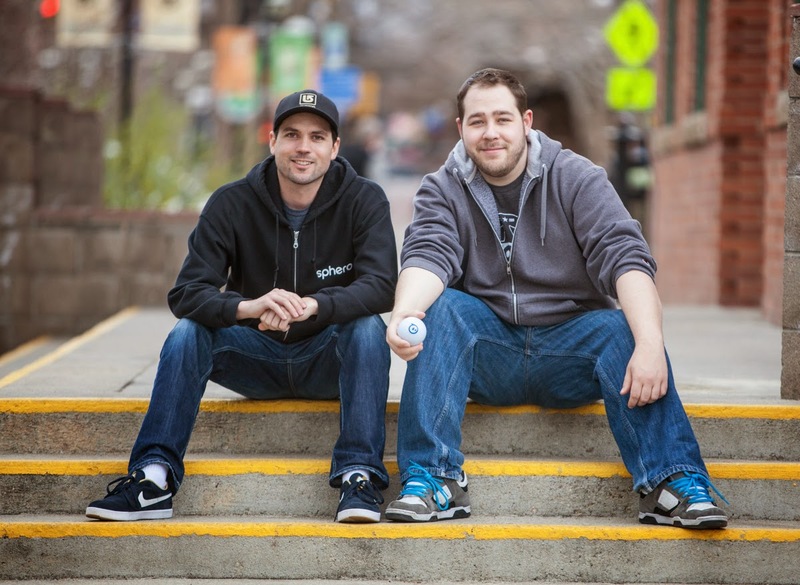 We had built a fully functioning prototype that people were genuinely excited about and we were propelled into working on Orbotix officially full-time when we were accepted to Techstars, a seed incubator in Boulder, Colorado. Was there a pivotal moment when you realized you’d made it? That you’d really turned that business a reality? Ian and I were both humbled by our first prototype Sphero being shown on Gizmodo — the video got nearly 60,000 views in a single weekend. For us, it seemed we had discovered a form factor that struck a chord with the world. Securing our series A funding was another obvious milestone, but was really just the beginning of a long journey towards success. Let's face it — setting up email, calendars, a shared "drive" space, simple forms, a QA site and hosting, among other things, would just slow us down from our real goals. Using Google Apps lets our company focus on what we do best, and have someone else focus on keeping our email secure and syncing our calendars across all our devices. We would’ve launched our education program earlier on in the game. We started pretty late with SPRK — “Schools, Parents, Robots, Kids” — to inspire and teach kids to be tomorrow’s inventors and innovators by teaching them concepts in programming, robotics and math in a fun way, and wish we had thought of it earlier. The Sphero product is a really natural educator of technology, but it took a few years to realize we could build an educational curriculum for students around it. 1. Be extremely critical of your own products, dream big, and go HUGE. 2. Don't get in over your head, be intellectually honest with yourself, co-workers and the board. Editor's note: Did you know 60% of young business owners saw an increase in customer engagement after getting a professional email address? Or that 81% of young business owners said that online file sharing is critical to their businesses? That’s just a snapshot of what we learned from the Young Business Success report and infographic we released to kick off National Small Business Week. To recognize and celebrate the young businesses taking the entrepreneurial leap, we’re revisiting a few customers to hear how they got their businesses off the ground and what they’ve learned along the way. 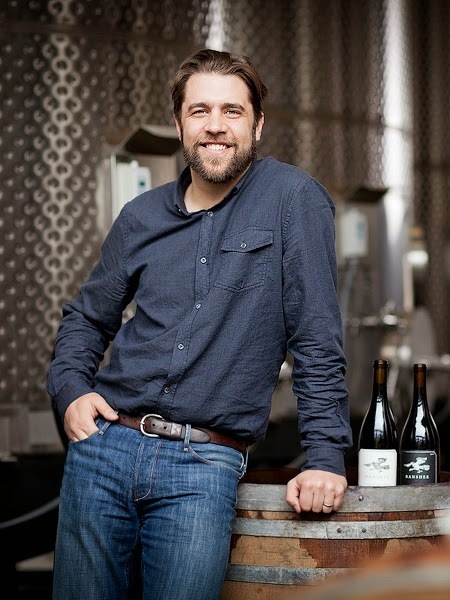 Today, we hear from Noah Dorrance, co-founder of Banshee Wines, who first shared their Gone Google story back in 2012. What inspired you to start Banshee Wines? The inspiration for Banshee was a shared love of wine among friends paired with a great opportunity in the market. We started our business in the midst of the late 2000s economic crash, but for us the timing was perfect: things were relatively cheap and possibilities that weren’t there a few years before were suddenly open. Since we’re all friends, we had an acute sense of trust in one another’s capabilities and a good sense of how all those things fit together. Without each other, none of us would have been able to build what we have built together. What made you decide you’d actually stop what you were doing and turn your idea into a business? We started Banshee as a side project while we kept our day jobs. In a sense, we were burning the candle at both ends, which is much easier to do when you’re finding success. The demand just kept growing until we had to drop everything and work on Banshee full-time. Although it’s not feasible for every entrepreneur, I highly advise getting as far down the road as possible with your startup before leaving a steady paycheck. I’ve done it the other way, and this way was much more fun. When we first started, we didn’t have an office or any real infrastructure. We were just three driven guys with the right idea, skills and set of contacts. Google Apps gave our bootstrapped, fledgling business a core set of tools that allowed us to work together more efficiently and organize ourselves with ease. We were able to devote more time to making and selling wine because of Google Apps. There may a few examples to disprove this, but I’d suggest figuring out first how and who to sell your product to. If you can do that, everything else is possible. Second, make sure you’re willing to invest all of yourself in your idea. Think of it like getting married. Be ready to eat, breath, and drink it every day. Editor's note: Did you know 60% of young business owners saw an increase in customer engagement after getting a professional email address? Or that 81% of young business owners said that online file sharing is critical to their businesses? That’s just a snapshot of what we learned from the Young Business Success report and infographic we released to kick off National Small Business Week. To further recognize all the contributions small businesses make, we'll also be highlighting a few customers throughout the week to hear how they got their businesses off the ground. Twenty five years ago, Yong Kim, the father of a Googler, decided to open a dry cleaning business in the New Jersey suburbs. His first move as a brand new business owner? Give it a name starting with the letter A, so it would show up first in the dry cleaners section of the local Yellow Pages. Those ubiquitous Yellow Pages may still be around, but starting a business today is a different ballgame. With the arrival and explosion of the Internet, new companies rely less on the resources of yesterday and more on tools built in the cloud to help turn their ideas into living, breathing, successful businesses. This shift in resources has changed the way business owners can start and run their companies. No more carrying around floppy disks — with cloud storage, you can access important documents from your office, at home or at the 6th grade soccer game. No more worrying about missing an important call if you step away momentarily from the work landline — with video conferences, you can run your business from your computer, tablet or smartphone, even if you’re at the airport or rushing out to get your business cards at the printer. No more relying on an expensive storefront to show you’re in business -- with work email and websites, you can kickstart the company with a far smaller financial investment and without leaving your computer. Starting a business: After getting a professional email address, 60% of young business owners saw an increase in customer engagement after they got a professional email address, and 42% saw an increase in sales. Building a business: 81% of young business owners said that online file sharing is critical to their businesses. 73% said that accessing email and documents from a mobile device helps them to close more sales. 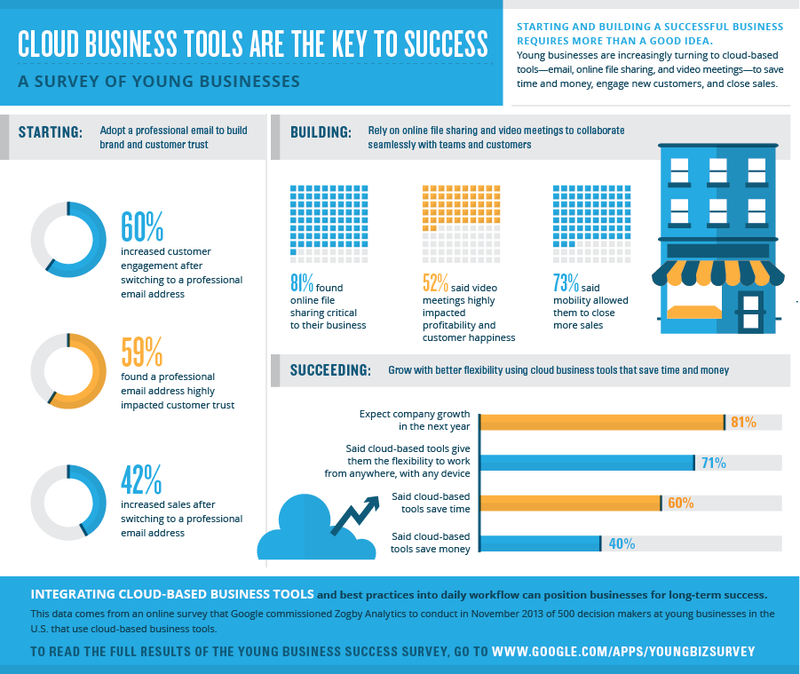 Succeeding in business: 81% of young businesses said they expect their companies to grow in the next year, and of that group, 69% said part of the growth is due to their use of cloud productivity technology. Small businesses have come a long way since the days of Yellow Pages marketing. And with a little help from cloud technology like Google Apps for Business, they’ll continue to grow — even faster than before. Editor's note: Today, as part of Teacher Appreciation Week, we’d like to highlight Lucie deLaBruere, former technology coach and consultant, and all her fellow educators at St. Albans City School, a K-8 school serving 670 students in St. Albans, Vermont. Schools can get started with Going Google and see what other organizations that have gone Google have to say. St. Albans City School has seen its fair share of tough times, especially in the last few years, but we don’t let a struggling economy get in the way of our promise to give our talented students the best learning tools available. We just chose to adopt technology that's both affordable and easy to put in our kids' hands - Google for Education. Google's tools have helped level the playing field at St. Albans City School by bringing teamwork and collaboration to school projects. Our students face challenges that would normally impede them from using the kind of premium technology available to other students across the country. Many don’t have their own computers at home, split their time between different parents’ homes, or attend after-school programs where they don’t have access to their homework or class materials. In our search for better learning tools that would address these challenges, we discovered we could use Google to provide each student with a digital locker that could be accessed from anywhere. Students figured out before we did that they needed better ways to work together – many had already discovered Gmail and Google Docs and were using the apps for projects. When we made Google Apps for Education available for the entire school, the students quickly and enthusiastically joined in. One of the first times that these tools helped provide a game-changing learning experience was when we conducted the “City Lights” project a few years ago. Our 7th and 8th graders used GPS devices, Google Apps for Education, Google Maps, and Google Earth to map locations of every streetlight in the city, then researched the link between crime and the lack of lights. They even presented their research to the St. Albans City Council - all with Google Docs and Slides. They got to experience civic engagement first-hand and watch how their recommendations played in the design of the city. More importantly, it showed students the impact they could have when empowered with Google tools. I work now with a handful of schools in Vermont, but I still consider St. Albans “my school.” Students there continue to uncover new ways of improving our community, like how they’re teaming up with local bike club members and parks employees to improve trails at the nearby Hard’ack and Aldis Hill recreation areas. This work will also reduce the amount of nitrates and other pollutants getting into Lake Champlain. They’re hiking every trail in the system, and will add coordinates, descriptions, and images into Google Maps. Eventually, students will report on their findings using Google Apps. Google tools have become so essential to everyday learning that my colleagues and students now cannot even imagine getting through the day without them. Google Apps for Education, along with Chromebooks and Nexus 7 tablets with Google Play for Education, have helped transform St. Albans into a state leader for its use of technology, not just in the classroom, but beyond the walls of the school in the community. Which teacher inspired you? Was there an educator that went out of her way to see how you were feeling? It’s Teacher Appreciation week, so we wanted to share a story about a teacher that has inspired us. In 2012, we filmed first-year high school teacher Andrea Kornowski two months after she began using Google Apps for Education as an avenue for students to share what was happening in their academic and personal lives. Today we’re following up with Miss K. about her success at Kettle Moraine High School in Wales, Wisconsin, and how Google tools have helped her and her students. How did you come up with the idea to use Google Forms with your students? I had been using Google Apps a bit for a few months when I attended a Google Apps for Education Summit. The presenter, Hank Thiele, asked us, “Do you know what’s going on with students outside of the classroom?” That question really made me think. It inspired me to find a way for students to communicate with me. I believed that if students could open up about what motivated them and what they were struggling with personally, they might feel more comfortable coming to me about academics, as well as issues outside of the classroom. The video about the Forms you created to connect with students received a lot of attention. What was the reaction of students and teachers at your school? Students were very excited, especially those involved in making the video. The video started a Google Forms revolution. Everyone, from the school nurse to other teachers, wanted to use Forms to connect with their students too. There was a learning curve for faculty, and so we held EdTech Challenge Site Days, personalized professional development, and an Annual KM Technology Day to support school-wide learning. How has your classroom changed since your students began using Google Apps for Education at school? Google Apps has opened up the walls of the classroom because teaching and learning can now happen outside of school, too. Last year, my Physical Science students needed extra support writing blog entries. One student who had a lot of trouble with writing, emailed me at 3:45 p.m. before I even had a chance to leave school, right after classes let out, eager to review his blog post. We worked on revising his blog in a shared Google Doc together in real-time using Gchat. This scenario has happened multiple times. I also have more flexibility with Google Apps. My workload is more manageable because I’m not confined to finishing everything during the school day. I can access lesson plans, student work and email after school hours from home. How has your role as a teacher changed in the time since you started using Google Apps for Education in your classroom? With Internet-connected devices in students’ hands, the teacher is no longer the sole owner of knowledge. Students consume Internet content voraciously, but I teach students that they can be creators and sharers of content, as well. I don’t always deliver new content — my Advanced Placement Environmental Science students each research specific topics and add content to class-shared presentations. We also recently created Google Sites to demonstrate the difference between renewable and nonrenewable energy. Fifty out of 53 students had never created a website, so this was the first opportunity for most students to publish digital content. As content-creators, students take greater ownership of their learning. I see how technology is affecting teaching everywhere, and teacher training. I have visited my alma mater, University of Wisconsin-Whitewater, to share what teachers have to look forward to when it comes to technology. What is the biggest impact you have seen from using Google tools? My students are more prepared for college and the workplace because they are using the tools they will eventually use in these environments. I tell students they are allowed to have devices at their desks as long as they are in “Classroom Safe” mode, which means that devices are face-down until they are permitted to use them. Classroom management is a whole different world with the introduction of technology. What do your students think of using the Google tools? Editor's note: Yesterday we announced Classroom, a new tool coming soon to the Google Apps for Education suite that lets teachers create and organize assignments quickly, provide feedback efficiently and communicate with their classes with ease. Jennifer Holland, a Program Manager on the Classroom team, worked closely with over 90 teachers and more than 1,300 students to pilot and gather feedback on this new product. She recently sat down with some of the educators to get their stories of how they’ve used Classroom and understand the impact it has had on their schools. Learn more or apply for a preview on the website. As a teacher, how has your experience been with Classroom so far? Paul Lepore, 8th grade Social Studies teacher, Felix Festa Middle School, NY: Teachers are able to assign work to their students in a flash, therefore maximizing student learning in the classroom. I really think that Google has changed my craft as a teacher for the better. The products are easy to use and allow teachers the autonomy and flexibility they need to engage students in dynamic and constructivist learning activities. Phil Halbig, 6th grade English and Social Studies teacher, EA Hall Middle School, CA: We’re using it constantly, and we’ve gone 100% paper-free in under a week. Laura Barton, Science teacher, Fontbonne Hall Academy, NY: By allowing students to submit their work with Classroom, I can keep track of my sections, view grades easily and mark assignments during any free time I have, without having to carry stacks of paper around. Classroom has made this process so easy and convenient. Nicole Marinello, English teacher, Fontbonne Hall Academy, NY: Using this has opened the doors to the real world in my classroom. With my juniors, I was able to have them do a research project on brands that appear in Death of a Salesman. They were required to make a commercial and a Google Slides presentation. I used Classroom for the students to turn in their slides. The work generated from this project was incredible. Tell us more about how you’ve used Classroom. Jenna Caufield, World History teacher, Fontbonne Hall Academy, NY: I believe it’s important for every student to participate in class. I make sure to call on students even if they don’t have their hands raised. The reality is that some students have a lot of great things to say but they’re anxious about saying it out loud in front of the whole class. Classroom gives the student a chance to have an opinion without having to speak publicly. Cathy Cowan, 8th grade, KIPP Bridge, CA: What impresses me the most is that all students feel comfortable communicating using the device, which is not the case in a traditional discussion-based classroom activity. Elizabeth Fiorella, Math teacher, Fontbonne Hall Academy, NY: I posted an assignment to be done over spring break for my algebra classes, in which they have to watch a video and answer just 6 multiple choice questions. I love that some of them have already turned in the assignment so I can start grading a few of them at a time, rather than all of them at once when we get back from vacation. I also love that the link is right there so that they can just click on it and it will bring them right to the video. How does managing assignments with Classroom differ from using Google Docs and Drive? Heidi Bernasconi, 12th grade Marine Biology teacher, Clarkstown Central High School North, NY: With Classroom all the students’ assignments are in one spot for commenting. This is more seamless than if I had just shared a Google folder with all the same resources. The first assignment took a very short time to grade. I was even able to return assignments before the due date, something I can't really do with other tools. Paul Lepore, 8th grade Social Studies, Felix Festa Middle School, NY: I was grading projects and I had an "aha" moment — I will never use a Google Form as a "turn-it-in-form" again. Classroom is really a faster way of grading. Teachers will really appreciate this. As a school administrator, what impact have you seen from Classroom? Toni Ann Piscitelli, Information Technology, Clarkstown Central School District, NY: This latest addition to the Google Apps for Education suite underscores Google’s commitment to providing schools with tools that fit seamlessly into the instructional landscape. And, at no cost for the product and no anticipated cost for training, this product fits seamlessly into our budget. Mark Surdyka, Director of Technology, Fontbonne Hall Academy, New York: At first we were nervous about starting Google Apps and Classroom all at once with every teacher in our school. But it’s probably better to do it this way with a big bang than in stages, which would’ve taken forever. I see people who barely used technology now using this every day. Mary Ann Spicijaric, Principal, Fontbonne Hall Academy, NY: When I walk by our classrooms I hear a lot of talking, and it’s not teachers talking — it’s kids talking. And that’s exciting. We’re moving more toward student-centered instruction. As a student, what do you think about Classroom? Grace, 9th grade student, NY: I love the easy access to most of my work right from my computer or phone. It organizes all of my work into different sections and I don't have to worry about keeping track of papers. Lindsey, 8th grade student, NY: It’s very efficient and makes it really easy to share study notes; before only one of us had the paper copy, but now we all can use the same resources to study. Alexandra, 8th grade student, CA: I definitely love this! It lets us communicate freely and lets us tell our thoughts without anyone description. Also, everyone gets to give there opinion and we are all participating. Editor's note: Today’s guest blogger is Lieutenant LeAnne Browning from the Atlanta Police Department (APD). She and her colleagues have incorporated search and mapping data into police operations to make the department more efficient. See what other organizations that have gone Google have to say. 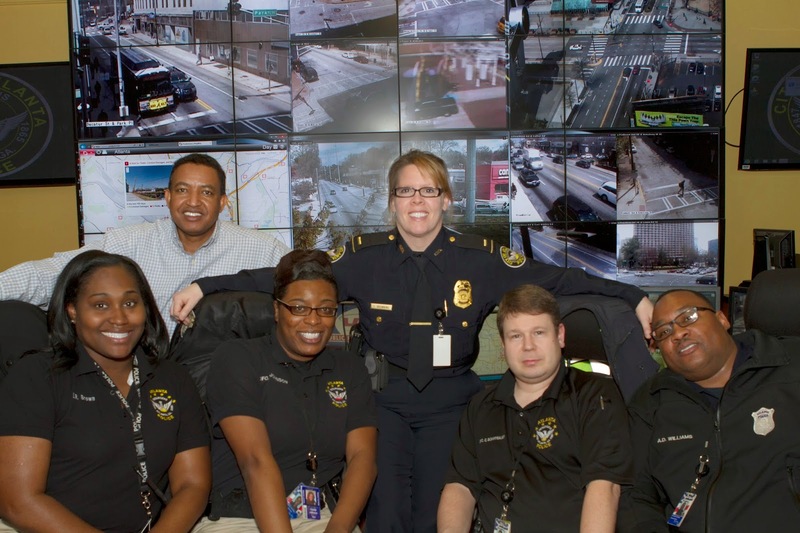 At the Atlanta Police Department, our 2,000-plus sworn officers are devoted to working with the community to develop innovative problem-solving strategies. Thanks to these efforts, the crime rate dropped by 44% between 2000 and 2012. We’re proud of our strong reputation among Atlanta residents and law enforcement agencies around the world. But we know we can always do better, which is why we started Operation Shield back in 2007. The goal is to further prevent crime and improve emergency preparedness with cutting-edge technology and private sector partnerships. One major component is our Video Integration Center (VIC), a surveillance hub and physical security information management platform built with Google Maps technology that gives us instant access to 2,500 cameras throughout the city. When a 911 call comes in, it’s automatically plotted in Google Maps and paired with the nearest live camera images. That way, operators can give real-time information to responding officers rushing to the scene. Now we’re using Google Search Appliance (GSA) to make the VIC even more powerful. Our partner, Edge360, helped us develop Search360, a search and investigative tool built with GSA that allows operators to search across multiple databases for details like prior incidents at the same address, license plate numbers or descriptions of subjects. Since the system is integrated with Google Maps, it runs automated searches based on geocoding to give analysts fast visual representation of search results. This helps them generate a photographic lineup to send to the responding detective’s mobile data terminal, smartphone or tablet before he or she reaches the crime scene. Gathering information for investigations used to be slow and tedious. As a detective seven years ago, I had to travel to the scene, interview victims and witnesses, then spend hours or even days back in the office running searches in multiple databases, such as our mugshots database or our report management system. With help from Edge360 and Google, that process is almost instantaneous. When I joined the department 19 years ago, I never imagined how technology could work in tandem with the traditional tools police officers rely on—our instinct and experience. But that’s exactly what’s happening with Operation Shield. We’re hoping it will improve the quality of life for Atlanta residents by making our streets, parks and neighborhoods safer and more prepared than ever before. Cristin: Was there anything particularly surprising about the impact of Google for Education at your schools? Todd: There were concerns that increased technology usage would take away personal interactions, but we actually found that the majority of students and teachers in our programs feel closer. They take advantage of the technology tools to stay connected whenever and wherever they choose. Teachers spend more time working with individuals and small groups, because the new technology has allowed them to monitor what each student is doing at any given time and adjust instruction on the fly. 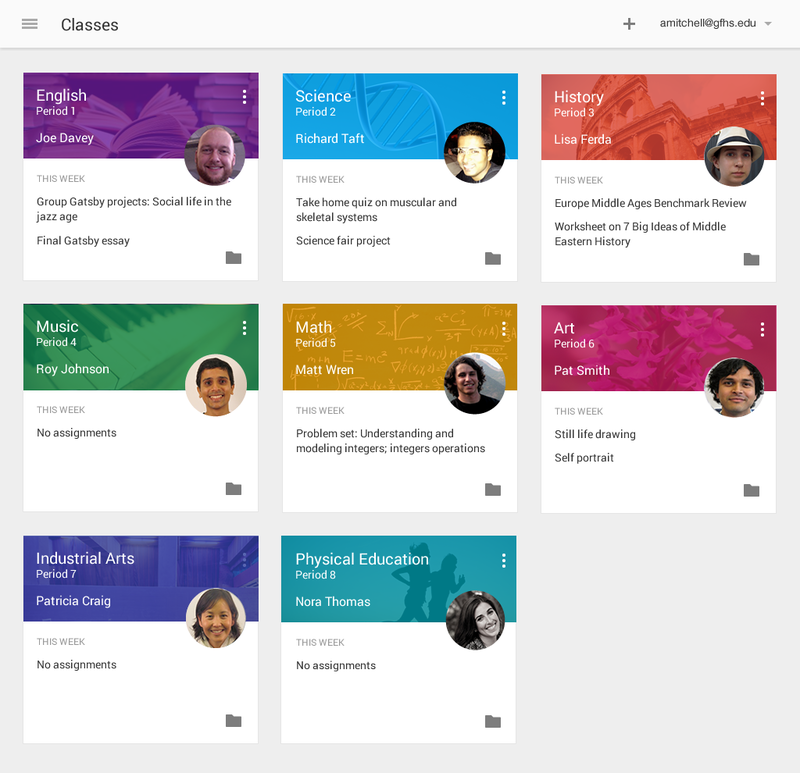 Cristin: What’s your advice for teachers getting started with Google Apps for Education? Carrie: Take full advantage of Google Apps to encourage teamwork. The most unexpected impact I’ve seen has to be the camaraderie between the students — and myself. There’s a willingness to problem-solve and help one another when working within the technology. These technologies foster teamwork otherwise not possible in the traditional classroom. Susan: Ease into it and let the kids help. They catch on quickly. It's always good to have a few kids in the classroom who can be the experts and roam around the room to help you and the other students. Cristin: What’s your advice for educators whose students will have Chromebooks in their classrooms? Todd: Learn the basics before doing anything in the classroom. This goes for teachers and students — everybody should know how to use Gmail (for sending, receiving, and organizing mail), Google Drive (for creating, naming, sharing documents and folders), and Calendar (for organizing agendas and tasks). Jennifer: Yes — start with the Google Apps basics, but also join online professional communities, such as Edutopia, to learn about how other teachers are finding success with Chromebooks in the classroom. The Chromebook is your paper and pencil — you can do pretty much anything on it that you did before, but with newer, exciting tools. Cristin: Finally, what advice do you have for teachers getting started with tablets with Google Play for Education? Cara: Tablets with Google Play for Education help teachers search for tools and apps by grade level, content or curriculum standards. Take your time to look through what is available and test out the app yourself or with a small group of students before rolling it out to everyone. Susan: Encourage students to stay organized from the start using some simple tools. They can try Google’s app Keep. It’s great for organizing & note taking, and everything can be saved on Drive. Also AnyDo is a great organizational tool to help students accomplish all their tasks. Todd: I would also advise that teachers not put pressure on themselves to become masters of the technology. There is too much to learn, too little time to do it, and once you learn it, everything changes anyway! Teachers should continue to be the experts in their subject matter, learn enough to facilitate the technology, and design learning experiences where students are the ones working hardest in the classroom. Editor's note: Earlier today we shared a story about Hillsborough School District in New Jersey, the first district to adopt the complete Google for Education solution. 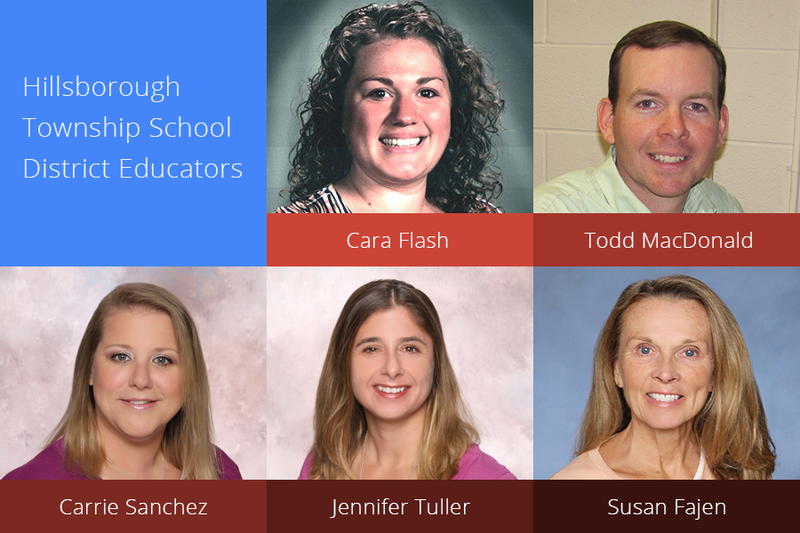 Today, we continue their story with an interview between Cristin Frodella, Head of Education Marketing at Google, with a few educators from the district — Todd MacDonald and Cara Flash (Technology Integration Specialists), Susan Fajen (4th grade teacher), and Jennifer Tuller and Carrie Sanchez (5th grade teachers). Cristin: What impact have you have seen from using Google for Education that you couldn’t get with other products? Susan: Google tools offer more possibilities for addressing a variety of student learning styles, which puts the kids in the "driver's seat" as far as engagement goes. Whatever you did before technology — packets, worksheets, notes, dry erase boards — you can do on a tablet or Chromebook. It's all inside. Todd: In many of our Chromebook classes we’ve seen a big shift towards collaborative, student-centered learning. In these classrooms, you’ll find students that are self-directed, working at their own pace, switching between tasks with ease, and constantly working with their peers, both virtually and face-to-face. And in classes that use Nexus tablets, we’ve seen teachers finding new ways to differentiate instruction, giving students access to different apps, books and videos based on each student’s different needs. Jennifer: Not only do I see the students engaged more, but they take ownership of their learning. They have the world at their fingertips at all times and can find out the answer to anything at any moment. They even email me resources that they find at all hours to help them and their peers understand and study the concepts that we are learning in class. Jennifer Tuller and Carrie Sanchez are 5th grade science teachers at Auten Road Intermediate School in New Jersey, part of the Hillsborough Township School District — the first district to offer its students and staff the complete Google for Education solution. 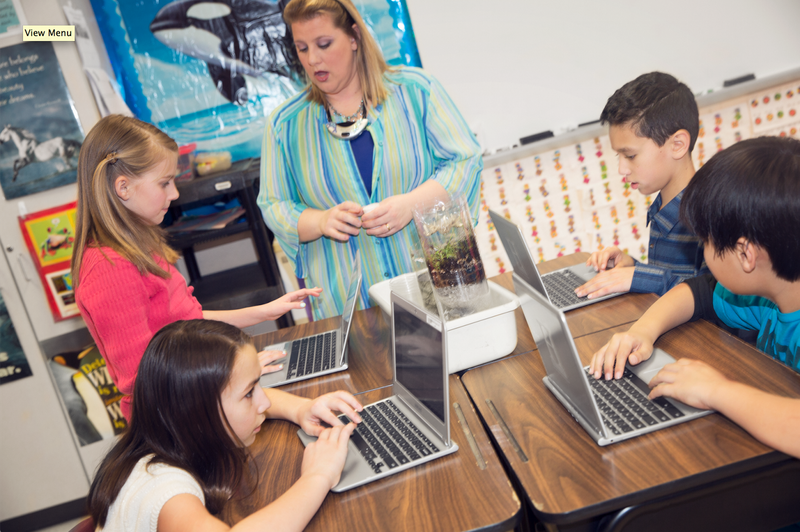 In Hillsborough, the students and teachers work together with Google Apps, Chromebooks and tablets with Google Play for Education. When we visited Jen and Carrie’s classrooms a few weeks ago to see how students used the tools, I was extremely inspired by what I saw. Students were working on an ecocolumn project, where they were closely observing the interaction between living and non-living elements in land and water environments. Before this year, the teachers told me, students had to individually log their observations on paper, which limited them from working as a group. But this year, students eagerly documented their observations together in real-time with Google Docs on their Chromebooks, compared the growth in their ecosystems by looking through the photos they had taken with their tablets, and presented the final report of their findings through Movenote — an app in Google Play for Education. The kind of new, collaborative learning I saw in Jen’s and Carrie’s classrooms reinforced the impact of simple and powerful tools when used together. Inspired by the Auten Road students and their ecocolumn project, we put together this video. Everytime I watch it, I smile thinking about the kids working together to construct their own ecosystems and wish I could have done a project just like it when I was in 5th grade. Later today we’ll share an in-depth interview with Carrie, Jennifer and some of the other teachers from the Hillsborough school district, who will provide some tips about how to drive classroom impact with Google for Education.